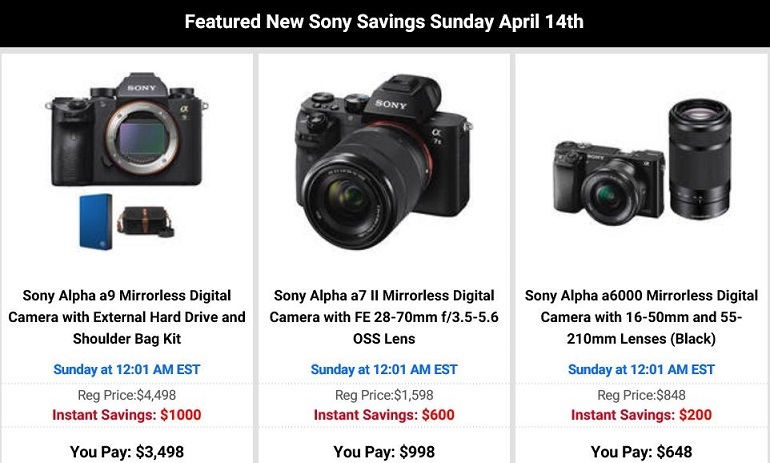 Sony USA released the new instant rebates, you can save up to $1,000 on selected Sony mirrorless cameras and lenses. Below are the detailed savings and direct links to the major US stores. Order now if you are interested. $1,000 off on Sony a9: $3,498 at Amazon, B&H, Adorama. $500 off on Sony a7 II: $898 at Amazon, B&H, Adorama. $400 off on Sony a7R III: $2,798 at Amazon, B&H, Adorama. $150 off on Sony a6300: $748 at Amazon, B&H, Adorama. $150 off on Sony a6000: $398 at Amazon, B&H, Adorama. $100 off on Sony a5100: $348 at Amazon, B&H, Adorama. $200 off on Sony FE 24-105mm f/4 G OSS Lens: $1,198 at Amazon, B&H, Adorama. $100 off on Sony FE PZ 28-135mm f/4 G: $2,398 at Amazon, B&H, Adorama. $100 off on Sony FE 70-300mm f/4.5-5.6 G: $1,098 at Amazon, B&H, Adorama. $100 off on Sony Zeiss FE 35mm f/1.4 ZA: $1,498 at Amazon, B&H, Adorama. $100 off on Sony Zeiss FE 55mm f/1.8: $898 at Amazon, B&H, Adorama. $100 off on Sony FE 90mm f/2.8 Macro G OSS: $998 at Amazon, B&H, Adorama. $50 off on Sony FE 85mm f/1.8 Lens: $548 at Amazon, B&H, Adorama. $50 off on Sony 20mm f/2.8: $298 at Amazon, B&H, Adorama. $50 off on Sony 50mm f/1.8 OSS: $248 at Amazon, B&H, Adorama. $100 off on Sony E 10-18mm f/4 OSS: $748 at Amazon, B&H, Adorama.